It begins with a bomb threat on the lavatory’s mirror. It ends on a Soviet airfield. In between: action, romance and tension, in this movie that breathes the 1970s. Short reviews for three air disaster movie classics: Broken Journey, The Crowded Sky and Fate is the Hunter. 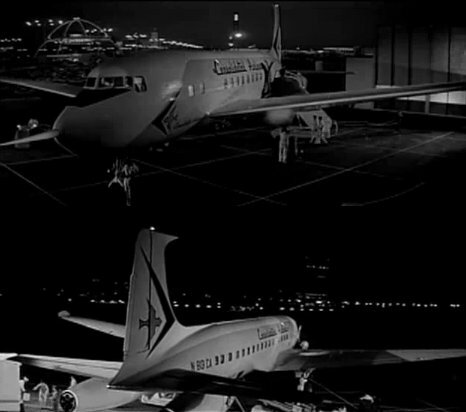 There are many well-known air disaster movies. Airport and its sequels come instantly to mind, as does the Abrahams/Zucker Brothers genre parody Airplane! Here are three lesser known movies from earlier decades, when the air disaster genre was considered still to be in its infancy. If you thought those air disaster stereotypes were old hat in 1970, wait until you see these. A trans-Pacific flight suffers serious engine problems. It’s a struggle between pilot and co-pilot to bring the flight to a safe end. AirJet flight 534 from London to Boston is crippled after its main cargo door is torn open inflight. Comparison between the movie Final Descent and the book it was inspired from, The Glass Cockpit by Robert P. Davis.